Barring any unanticipated monsoons, hurricanes, tornadoes, civil unrest or legal entanglements, work will soon begin to repair the drainpipe and standpipe that will enable the restoration of Lower Johnson Lake. On Monday night, (8/12/13) the Snellville City Council unanimously approved a contract with McEachern Dredging to make the repairs. The City will pay an amount not to exceed $34,800 to slip line approximately 115 feet of pipe that passes through the dam; the Summit Chase Homes Association will pay approximately $7,000 for the standpipe repairs and attachment hardware. One of the questions asked most frequently about restoration of the Lake is, “Why did it take so long?” There are a number of reasons– some of which are valid, while others are real head-scratchers. The core issue is that by state law, (with one or two specific exceptions having to do with non-profit entities) public funds cannot be used to repair or maintain private property. 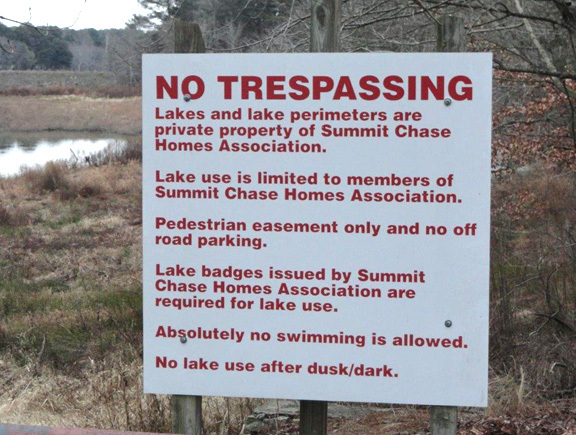 The Summit Chase HOA board of directors has repeatedly stated the lake and dam are owned by the association. That being the case, the HOA is responsible for maintaining the water handling equipment that establishes and controls the lake. However, the road that crosses the dam is a city-maintained street, so the city is responsible for maintenance, including work required to assure the integrity of the road surface and its base. Repairing the drainpipe without connecting the standpipe does not fix anything. The drainpipe is at lake bed level so if it was open to water flow, it would quickly fill with mud and debris—unless was connected to a standpipe. Clearly, both pipes need to be repaired at the same time. The City has been ready to fund its portion necessary repairs for over a year. However, most Council members were not willing to enter into a contract that would have been in violation of state law. Some of the original proposals for repairs would have had the City doing just that. In fact mayor and Summit Chase HOA member Kelly Kautz publicly criticized other Council members for not being in favor of the City paying all repair costs. State law notwithstanding, she took issue with Council members being against using taxpayer funds to “help” the HOA, when they had been instrumental in efforts to raise funds to help Aimee Copeland in her battle against a flesh-eating disease. Apparently, the fact that the funds given to Ms. Copeland were donations from private citizens—not taxpayer dollars– escaped her. Ultimately, the HOA did take legal action, the contractor responded, and the agreement for repairs was approved on August 12th. But not before the issue was used as a platform for political posturing. In spite of the fact that Sabbagh voted against the resolution urging the HOA to take immediate action, he continued to place the matter on Council meeting agendas. In so doing, he cited a structural urgency that didn’t exist, and ignored the potentially costly legal ramifications of publicly discussing a matter that was the subject of pending litigation. (There’s also the question as to why anyone would put a “consideration and action” item on a meeting agenda that would have the Council vote on a resolution that didn’t exist for the mayor to sign a contract that didn’t exist. See Troubled Waters, Broken Dam, Part 2.) So it was not surprising that many people who attended the August 12th Council meeting literally laughed out loud when Kautz tried to give Sabbagh credit for being instrumental in resolving issues that had delayed repairs. On a positive note, thanks to a number of people who have worked to find the most cost-effective solution and did not use the issue for grandstanding, a complex problem has been resolved. I hope it is resolved and you can move on to other items….